04.12.2008 The Serbian Chess Federation has officially confirmed, the money for Dusan Popovic have been collected! Special thanks to everyone who has contributed! We will keep you updated on future development. 25-year old Dušan Popović, chess Olympic player and state team member, today plays the most important game in his life, GAME FOR HIS LIFE, and only with your help the result will be in his advantage! Departure of this chess player, who is in top 10 chess players in Serbia, to the 2008 European Championship in Plovdiv has been unexpectedly canceled due to the cruel game of destiny when both his kidneys stopped working in the middle of March. His health situation is also difficult because of his blood group 0 -, which is the reason why none of the family members could be the organ donor. Yet, there is a solution. That’s transplantation from unknown donor, which should be performed in Russia. For this operation, financial assets in amount of 70.000 € should be provided. Dušan Popović was born in Sombor on 28th February 1983. He is a forth year student of Economics Faculty in Novi Sad. Dušan is multiple cadet chess winner of Yugoslavia. He is one of the youngest Olympic players who made forth best result on his table in Olympic Games in Torino 2006. The same year World Chess Federation officially recognised Dušan as grand master (which is the highest title in chess). 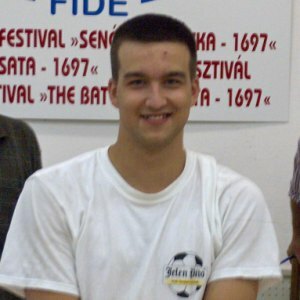 At the beginning of 2008, Dušan won the first prize in highly competitive international tournament in Bizovac, Croatia. We expect that the best Dušan’s results are yet to come in the future, and the first one is successful end of health crisis. If you need additional information, please contact Snezana Stojanovic, Serbia Chess Federation office chief, at +381 65 9999 515 e-mail: zanachesslady@yahoo.com, or Chessdom editors. Update, 17th April: Friends and clubs from Spain and Montenegro have quickly responded to the call and transfered first funds. Serbian Chess Federation is disappointed with suspicions raised in international community, but national body, clubs and players are in resolution to help the young man. GM Svetozar Gligorić joined the action and gave his contribution yesterday. The full list of donations and counter will be posted on the Serbia Chess Federation website tomorrow or on Monday. Update, 24th April: Please note that SWIFT code has been modified. This should eliminate the transfer problem that some people experienced over the past few days. New code is – KOBBRSBGFNS. We would like to thank Susan Polgar for the support and to urge playchess.com to help the young Grandmaster who is very popular on their playing portal. Serbian chess community is organizing a number of weekend tournaments and all subscriptions and other donations will be sent to Dušan. Update, 28th April: First tournament to aid Dušan’s operation was held on 28th April in Restaurant “Radovanje” in Preljina, near Čačak. 42 players from Čačak, Gornji Milanovac, Guča and Lučani took participation in the 9-round event with rapid time control. There were many who observed only, but everyone paid entry fee which was sent to Dušan. FM Radoje Irižanin from Čačak took the first place with 7.5 points, 2nd was FM Vladan Rabrenović with 7.0 and 3rd is FM Dušan Čolović with 6.5. Update, 10th May: Serbian Chess Federation and Chess Club Studentski Grad have organized the next humanitarian tournament on Saturday, 10th May, at the central library of Student’s City. There were 70 participants, among them 10 GMs, 6 IMs and 8 FMs. All players and guests, IM Alisa Maric, GM Branko Damljanovic, GM Igor Miladinovic, contributed to Dušan’s fund.